When it comes to buying office furniture, most people are not aware that refurbished cubicles are not the same thing as used cubicles. When you purchase office equipment that is used, this means that someone cleans and repairs it, if necessary, before passing it along to you. A refurbished cubicle is built from existing parts and sold again as ‘like new’. During the refurbishing process, a cubicle is closely inspected for flaws. If a manufacturer finds one, he or she may repaint or reupholster the part rather than fixing it with a simple repair. Although a refurbished cubicle may look new, it does not come with the same price tag. That is because office furniture manufacturers utilize existing material instead of starting from scratch. This allows you to save a significant amount of money when buying cubicles for your office. Your employees are unlikely to realize that the cubicles they sit at every day are not brand new. This is also true of clients or suppliers who visit your business. When you choose to purchase a refurbished office cubicle over a brand new one, you are keeping the materials it was constructed with out of landfills. Every cubicle you purchase from us has been repainted and refinished at a minimum. We realize that you probably have several questions about outfitting your office with refurbished furniture. We invite you to contact us by completing our online request form or calling us during regular business hours. You can expect to hear from an office planning specialist within one business day. He or she will schedule a meeting with you to learn more about your business and discuss how The Office Planning Group can help you outfit it for less. Office designs change like the latest fashions. As more millennials enter the workforce, their older counterparts are evaluating the best way to manage this creative, free-thinking group. Although this adaptation can be a challenge, a study by Bentley University recently found that 74 percent of non-millennials agree that millennials offer different skills and work styles that add value to the workplace. A conducive office space is a key component to the productivity of any generation. Millennials prefer open, communicative work spaces with the latest technology integration. What office trends are attractive to this young talent? The new generation of workers prefers office space that fosters collaboration. Low-walled cubicles create a team environment. Many offices are utilizing shared work space in addition to individual desks. For example, lounge seating is a trend that offers a comfortable spot for employees to spontaneously gather their teams. Another idea becoming popular involves having unassigned tables between work spaces, again providing an area for two or more workers to collaborate. 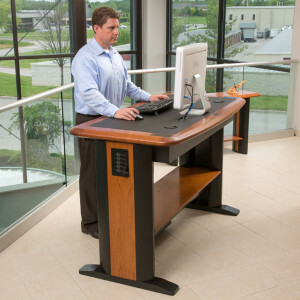 To decrease the health risks of prolonged sitting, employers are also utilizing high tables that allow workers to stand or use stools for their collaborative sessions. Even seating trends foster collaboration. Today’s young workforce likes to have mobile seating, chairs or stools that can easily move from their desks to collaborative work spaces. Bland, grey offices are a thing of the past. Color has been shown to boost productivity and improve employee mood. Experts say the five best colors that increase productivity are blue, green, white, red and yellow. Blue is specifically linked to higher productivity. Yellow improves concentration. And, green creates a relaxed environment. Consider brightly colored cubicle walling to create a productive, collaborative atmosphere for your millennials. Let the Office Planning Group help create the perfect environment for your office. 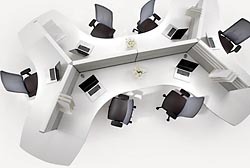 Contact us to speak with one of our office furniture professionals. Are Stand-Up Desks The Future Of Office Furniture? Sitting at a desk all day is the only way to get all the office paperwork and other communications taken care of, right? Well, not necessarily. There is a growing trend towards stand-up desks and it looks like they might change the way that every office worker spends their day. This innovative approach to office furniture benefits both employees and companies alike. According to a 2012 study by the British Psychological Society (BPS): “In a typical working week, people spend on average 5 hours and 41 minutes per day sitting at their desk.” The study also showed that people who sit at work are more likely to sit when they are not at work. This increased sitting time has a direct correlation with BMI scores and mental well-being. It has been said that sitting for long periods is just as bad as smoking and has many of the same debilitating effects. Long term health problems including, diabetes, cardiovascular disease and obesity and early mortality are all associated with inactivity. However, there is strong evidence that those that use a standing desk may burn more calories than their sitting counterparts, which may help to counteract some of those health issues. Sitting in one spot for several hours focused on a computer screen seems like the only that employees can get all of their tasks done. The problem is that once they begin to get tired, stiff and sore, it becomes more difficult to focus and productivity declines. Even though they are putting in a full work day, the amount of work doesn’t show it. People that have converted to a stand-up desk claim to have a higher energy level and that they are more alert during the day. When they feel good and energetic, they are more willing and able to complete the tasks at hand. Not only that, but they are more likely to report improved health conditions. For companies the benefit is that there are fewer employee sick days and an increase in productivity. The concept of working while standing isn’t new. In fact, some of the most famous people in history touted the benefits. Both Leonardo da Vinci and Virginia Woolf are said to have been advocates of the practice. One needs only to look at their success to realize that they just might have known something we don’t. Perhaps, one day, every office will be outfitted with stand-up desks attached to treadmills. If this trend catches on, the world’s offices will be full of slim, healthy, energetic and productive employees. Stand-up desks are certainly interesting, don’t you think? If you want to talk about this subject or anything else having to do with office furniture, contact us. We are always happy to answer your questions.